A “seek and find” book, There’s Something Wild In There presents eighteen exquisite illustrations set in nine spreads by artist Don Saint Denis, who has created an array of lush forest scenes featuring a variety of creatures who seem to challenge sharp eyes to find their hiding places. 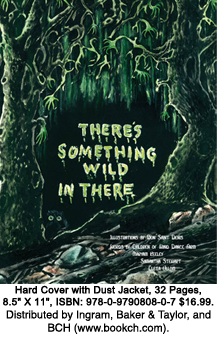 Accompanied by eight original poems by Children from Wind Dance Farm—a rural school providing supplemental instruction for homeschoolers—There’s Something Wild In There provides a feast of sight and sound for young readers and non-readers and their parents too. Illustrator Don Saint Denis lived most of his adult life in western Michigan where the creatures of forest, lake, and dune inspired his work. Employing a variety of mediums, he created a marvelous assortment of woodcarvings, sculptures, paintings, and drawings. He also imagined and illustrated a number of children’s books but never quite got around to writing the words for them. The children of Wind Dance Farm were happy to help with that. Writers Maryam Keeley, Samantha Stewart, and Cleta Ullom are students in West Virginia at Wind Dance Farm & Earth Education Center, whose school year programs and summer camps supplement the curricula of home school and public school students. Click HERE to read an interview with the authors from the Hagerstown Herald-Mail.